Taking control of politics – can digital democracy help? This post was written by Bruce Ryan and does not necessarily reflect the opinions of his colleagues or anyone else. Beneath all the current brouhaha about Brexit, interesting goings-on in the White House, and struggles between ‘populists’ and the ‘old guard’, it’s fairly clear that there is room for improvement in the ways we do politics. In most democracies, representation is the main model: the people choose representatives who make laws and govern. In a purely representative democracy, citizens would have no part in law-making or government except via elections. Fortunately, most democracies also have participatory aspects: citizens can influence representatives and choices between elections. Methods in use just now include lobbying, participatory budgeting, recall of representatives, and referenda. However, the European Union is now looking at digital crowdsourcing as a way of enabling citizens to engage directly in public decision-making using digital tools. In the UK, this work is being undertaken by The Democratic Society (DemSoc). I took part in the UK session at Newspeak House on 9th February. This session has been storified by DemSoc’s Millicent Scott Brooks but the following is my impression of the event. The first part was a small-group discussion on what is democracy? My working definition, based mostly on gut feeling, is ‘where people make (collective) decisions over the things that affect their lives’. In the discussion, it was suggested that ‘digital democracy is only about enhancing our representative democracies, not replacing them’. However, I’m not the only one who is dubious about that. So far, 27 initiatives have been submitted to Latvian municipalities or Latvia’s parliament. 13 of these have become new laws; amendments to existing laws or other legislative acts. Half of them brought about changes before gathering the required number of signatures. Participatory budgeting in Scotland is currently a very local way of allocating small pots of money, often addressing inequalities. The ‘first generation of participatory budgeting in Scotland’ has allocated around £1·75 million – about 0·002% of annual Scottish local authority budgets. 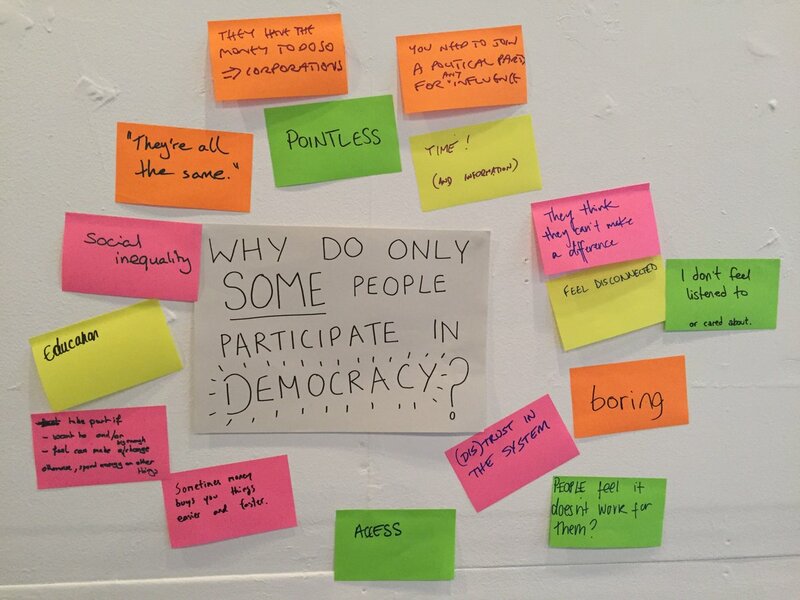 DemSoc is currently working with the Scottish Government and local authorities to promote participatory budgeting, so that it is used to allocate at least 1% of local authority budgets. There’s lots more information at PB Scotland’s website. According to its website (in Greek), DemocracIT is ‘an open source IT infrastructure for enrichment and strengthening of the process of public consultation’. It works by allowing users to ‘indicate problems on the text of the consultation’, ‘categorise the text into thematic categories’, to ‘rate and reply to other comments’. Hence ‘it offers the citizen and the legislator new possibilities’. Being open source, it can be customised and reused for any form of public or private consultation.There is much more information on the developers’ (SciFY) website. This presentation, by Daniel Ambrus, asked how can the EU legislative process be made less complicated? The process starts with the European Commission creating an impact assessment (these are generally not published), followed by a green paper (which is published) and then a white paper – a ‘final’ draft of the legislation and the reasons for it. The draft is then considered by the European Council and the European Parliament, in a process that can ‘take years’. This process can be followed at EUlex. Perhaps the most interesting fact from Daniel’s presentation is that UK MEPs represent constituencies, most EU countries’ MEPs are chosen by nationwide list-based PR systems. That is, these MEPs each represent their whole country rather than a part of it. This may lead to a democratic disconnection, or lack of accessibility to these MEPs. This presentation was followed by a discussion of where digital crowdsourcing could best fit into the EU’s democracy – what should it do and how should it do this? Suggestions including building an ‘Amazon of democracy’ (as opposed to the traditional ‘stores’ we have just now), and looking at ways to encourage more people to take part in democracy. I’d known for a long time that there are problems with the EU, although the problems I was aware of were to do with the common agricultural policy. (Here’s Wikipedia’s piece on CAP issues.) However, this session opened my eyes to problems with the EU’s basic democracy, and I appreciate Elisa and Daniel’s honesty about some current issues. I’m grateful to DemSoc, the presenters and the others I talked with for informing me and challenging my thinking. While I assume that there will always be problems with an organisation that encompasses over 500 million people, it seems clear to me that the current ‘representative’ system is ripe for improvement, and that digital democracy is one set of channels for achieving this. (I’m convinced that we will always need non-digital methods too.) I look forward to reading about the insights from Belgium, Finland, France, Greece, Latvia, Slovenia and the Netherlands. This entry was posted in Digital engagement, General, Hyperlocal democracy by Bruce Ryan. Bookmark the permalink.